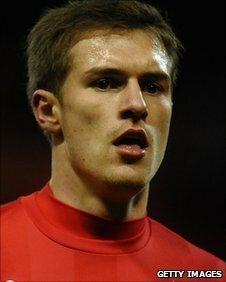 Cardiff City have completed a one-month loan deal for star Wales midfielder Aaron Ramsey from Arsenal. Ramsey travelled to Wales on Friday and completed his return to Championship promotion hopefuls Cardiff on Saturday. Ramsey, however, cannot play against Watford on Saturday as the player has not received international clearance. The 20-year-old, who had just completed a loan spell at Nottingham Forest, is returning to fitness after suffering a horrific broken leg in February 2010. Ramsey signed for Premier League giants Arsenal from Cardiff as a teenager for £5m in June 2008. Now Cardiff and title-chasing Arsenal have completed the loan deal which has been finalised within 24 hours of Ramsey's return being made public. However, Ramsey requires international clearance as he is transferring between an English and Welsh club so is not available for Cardiff in their home clash with promotion rivals Watford on Saturday. He must wait 10 days for a chance to make his Bluebirds home-coming against Reading at the Cardiff City Stadium on Tuesday, 1 February. Arsene Wenger revealed the potential loan switch in his Friday press conference when the Arsenal boss said: "I am considering to give Ramsey one month out on loan, with a possibility of him to go to Cardiff." Ramsey's arrival at the Championship high-fliers is to be their fourth signing of the January transfer window. And the 11-times capped Welshman is the second highly-rated youngster to sign for Dave Jones' side from Arsenal inside a week. England youth international Jay Emmanuel-Thomas signed at the Cardiff City Stadium on loan until the end of the season on Tuesday. And the Bluebirds are in the process of completing the signing of Israel international defender Dekel Keinan from Premier League new boys Blackpool on a two-and-a-half year deal. Ramsey's return to south Wales is a huge boost to Jones' creative midfield options as Cardiff are currently without injured pair Stephen McPhail and Jason Koumas. But Ramsey's arrival adds further expectation for the Bluebirds boss to secure promotion to the top-flight this season as Ramsey would join a star-studded squad that includes Craig Bellamy, Jay Bothroyd, Michael Chopra, Peter Whittingham and Seyi Olofinjana. Ramsey is Jones' seventh loan signing this season - joining Bellamy, Koumas, Emmanuel-Thomas, Olofinjana, Danny Drinkwater and Andy Keogh - although the club can only include five loan players in a matchday squad. "I don't want him to go to a Premier League club," added Gunners boss Wenger. "Because I want him to finish the season with us. I just look for competition for him." Ramsey graduated through the Cardiff academy and became their youngest player aged 16 years and 124 days when he replaced Paul Parry in a 1-0 home defeat by Hull City in April 2007. He was tipped by pundits as a potential star of the future and played in Cardiff's 2008 FA Cup final loss to Portsmouth before leaving for the Premier League. Cardiff accepted £5m bids from Manchester United, Everton and Arsenal but opted to join the Londoners after the Gunners flew him to Switzerland for face-to-face talks with boss Wenger at Euro 2008. Ramsey signed a new long-term Arsenal deal in June 2010 - a boost after he suffered a double leg break following a tackle by Stoke City defender Ryan Shawcross in February. Ramsey underwent surgery to fix fractures to his tibia and fibula in his right leg after the challenge by Shawcross, who was sent off for the challenge and left the field in tears. He made his return to action for Forest during his two-month loan spell at the City Ground against Leicester City on 29 November. Ramsey returned to the Emirates Stadium earlier in January, but Wenger now says the Caerphilly-born talent is back at his first club to build up his match fitness.